About a year ago, Swiftech brought the world an AIO liquid cooler that you could pull apart and retain the factory warranty, which was called the H220. If you wanted to rip apart any other kit on the market, you would have to forfeit your warranty which made this kit awesome to the extreme enthusiast. Unfortunately mid 2013, Swiftech pulled it from the U.S. market due to alleged patent infringement, leaving us folks in the U.S. in the dust. To help cater to the enthusiast, and teaming up with Swiftech, Cooler Master more recently introduced its 240mm liquid cooler that you can expand to more components than just a CPU, calling is the Glacer 240L. Yes, you are reading that right, there is no “i” in there to make it the English word “Glacier,” rather Glacer is the French word for “Freeze” or “Chill.” What’s great, is that this cooler works off of designs of the Swiftech H220 and pumps them up to beefier specs and avoiding those ugly patent disputes. Out of the box, the 240L is a fully sealed AIO liquid CPU cooler with a massive 3500 RPM pump mounted over the cold plate. If you wish, you can purchase additional water cooling components and include them in your loop. The system is rated with a head of 2.65 mH2O (8.69 ft H2O) and can push 165 litres (about 43.6 gallons) per hour, which means adding additional components shouldn’t be an issue! If you’re looking at the fans, these fans have pretty decent specs, having the ability to push a little over 86 CFM at around 40dBA. Today we’re going to take a look at the Glacer 240L kit as-is, no modular expansion, and we’ll also test it with a different set of Cooler Master high flow fans for comparison. If you’re looking to pick up this kit, you can find it for $139.99 shipped on Amazon, which is right in the same ballpark as a lot of other coolers this size. Included is a full two year warranty against failure, and this warranty retains even if you expand it with more components! 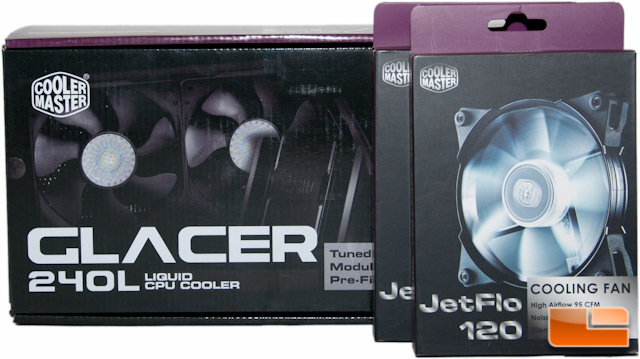 Cooler Master sent along two different Jetflo 120mm fans with this kit, so we will swap the stock fans out for the Jetflos and compare the performance between the two using the same settings. You can find the technical specifications of both fans below. 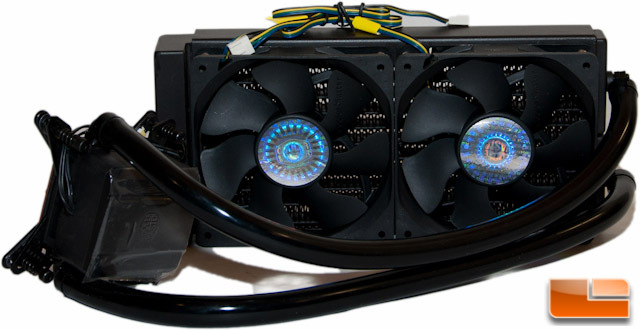 If you’re looking to grab these same fans for your Cooler Master Glacer 240L kit, you can have them for $20.98 shipped on Amazon or $16.99 plus shipping on Newegg. Before we can take a look at any tests, let’s take a look at the retail packaging and see what’s all included.